Movie studio Lions Gate’s $4.4 billion deal to acquire pay-TV company Starz has media mogul John Malone’s fingerprints all over it. A complex structure? Check. New governance-skewing non-voting stock? Yup. More influence for the man known as the Cable Cowboy? You bet. Starz shareholders shouldn’t be surprised at the modest premium on offer. Speculation about a merger began in February 2015 when Malone, best known for Liberty Global and similarly named enterprises, swapped 4.5 percent of Starz stock for 3.4 percent of Lions Gate shares. In the process he gained a seat on the “Hunger Games” studio’s board. Against the backdrop of cable consolidation, the tie-up makes industrial sense. And if Lions Gate could find synergies worth a reasonable-seeming 2.5 percent of combined revenue, or $100 million a year, once taxed and capitalized their value would easily cover the $400 million or so of premium on offer – and more. However, that’s partly because the price isn’t generous. Malone controls Starz with 48 percent of the votes thanks to Class B stock that has 10 times the voting power of regular shares. That makes it hard for other shareholders to argue. They’ll get cash and Lions Gate stock worth just over $32 a share, a 14 percent premium to where Starz A shares closed on Wednesday. Lions Gate plans to create a new class of non-voting shares. That’s what the regular owners of Starz will get along with their cash. Holders of super-voting Starz shares, like Malone, will receive fewer readies, but half their Lions Gate shares will carry voting rights. This helps explain why Malone and other central figures look set to land on their feet. Lions Gate Chairman Mark Rachesky owns just over 20 percent of the company. He’ll be diluted by the acquisition, but his voting interest will decline only slightly because non-voting shares will go disproportionately to others. Combine Rachesky’s interest in Lions Gate with Malone’s and those of Liberty Global and Discovery Communications, and there’ll be a near-controlling block wielding more than a third of the votes with barely more than a quarter of all shares, by Breakingviews’ reckoning. It’s classic Malone to wrap a smart deal in a complicated structure that’s good for him. 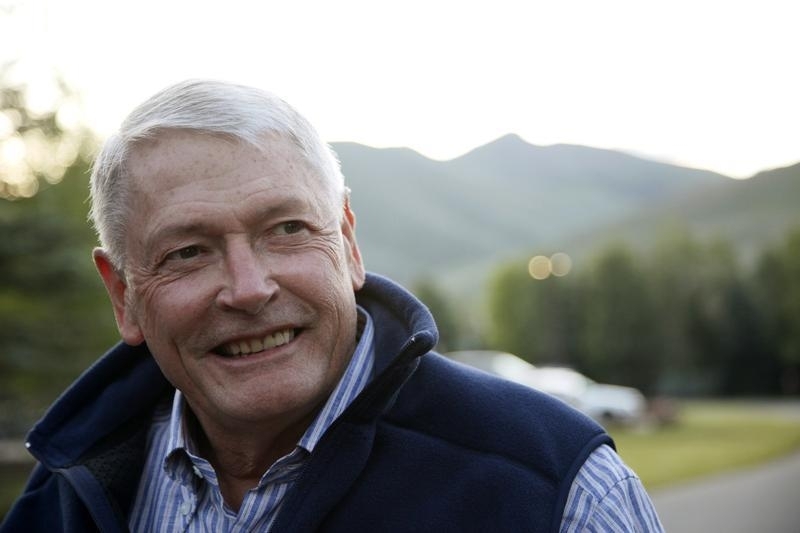 Liberty Media chairman John Malone talks to reporters as he arrives at the Sun Valley Inn in Sun Valley, Idaho July 8, 2009. TV and movie studio Lions Gate agreed on June 30 to acquire pay-TV network Starz for $4.4 billion in cash and stock, including debt. Each share of Lions Gate common stock will be reclassified into 0.5 voting and 0.5 newly created non-voting shares. Holders of Starz Class A common stock will receive $18 in cash and 0.6784 of a share of Lions Gate non-voting stock. 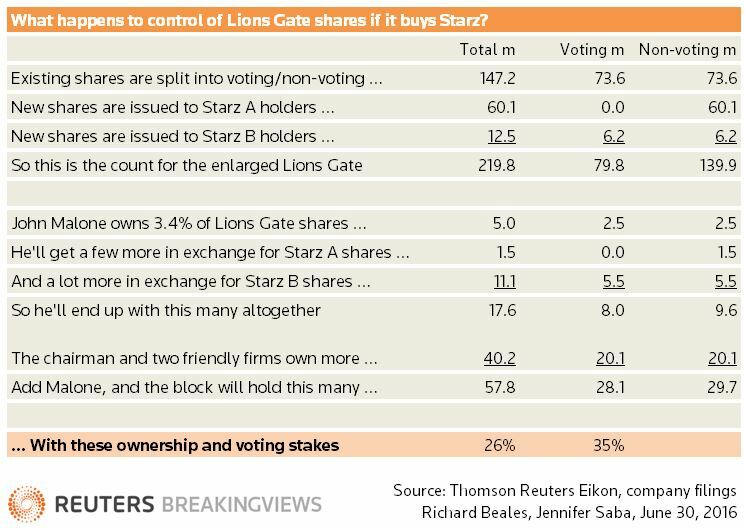 Holders of Starz Class B shares, which have 10 votes per share, will receive $7.26 in cash and 0.6321 of a share of Lions Gate voting stock and 0.6321 of a share of non-voting stock.